Thanks to train journeys, my purple Colourscape cardigan is almost done. I still have to attach the sleeves, knit the button-loops, find buttons and weaving in ends, of course, but they are all relatively minor things. It has been a very quick knit and one I have enjoyed a lot. The pattern was very straightforward and came together without a hitch. Okay, so I tell a lie: there was a hitch but it was of my own doing. See how the fronts have mitered corners? It's a super-easy technique which looks great .. but if you use a long-tail cast-on (it is my go-to cast-on method), it will not work right off the bat. The left front worked great, but the right front left me bewildered. It just did not want to mirror the left front despite me following the pattern intently. Then it dawned on me: you automatically knit the first row when you use the long-tail cast-on which essentially meant I needed to decrease whilst casting-on because the pattern wanted me to do a sharp sl 2, k1, p2sso decrease on the very first row. It all seems so obvious now, but it took me a bit of head-scratching to get to that point. If you do a knitted cast-on, you won't have the same problem, by the way. In her excellent The Handknitter's Handbook, Stanley remarks that a crocheted seam is fine if you anticipate wanting to recycle an item and need a seam that can be unravelled relatively quickly. I like a crocheted seam when I worry about being able to provide stability and structure. The two pieces - the buttonband and the front - stretch in opposite directions and I wanted to make sure that the seam did not pull and provide stability. The seam is bulkier than a mattress stitch seam would have been, but this does not show on the outside. In its own way, a crocheted seam is also rather pretty. I have been looking through my button boxes trying to find two buttons that work with this garment. 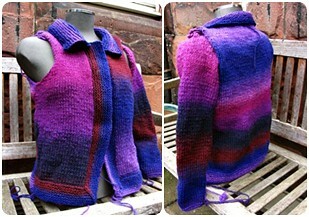 I'm thinking some rather chunky and earthy buttons would suit the style of this cardigan. However, while I do have several chunky and earthy buttons in my button stash, I cannot find any that really, really work. The Celtic knotwork buttons (four of them are tied together, one is facing) would be fine if they had been bronze- or copper-coloured. I don't think the silver colour works. 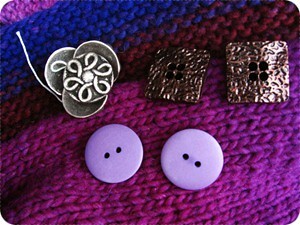 The lilac plastic buttons are foul and were only in contention because parts of the cardigan are lilac. The bronze-coloured buttons were birthday presents from my mother, but they seem too shiny for this project. They'd be lovely against some dark green tweed, though. I've looked the usual places but to no avail. Well, I have sleeves to ease in first..